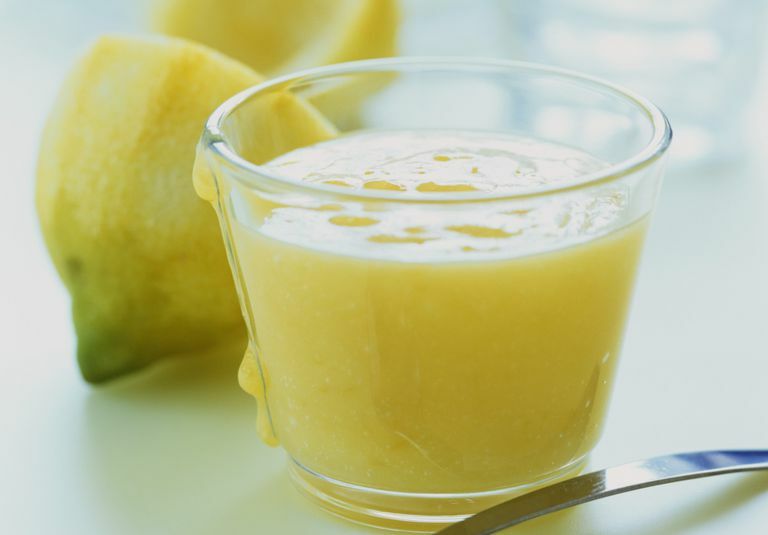 Lemon curd originated in the 1800s and early 1900s and was generally used for topping baked goods like scones and crumpets. As it is still used today, it was also used in pies, pastries, and cakes. The smooth texture and bold flavor of lemon curd is still used to spread flatbreads, muffins, pancakes, and biscuits for a citrusy flavor. You can spread this dairy-free version on whatever you like, or even eat it on its own in dairy-free yogurt. 1. Cut the margarine up into pieces (around 8 to 10 pieces is good), and then put them into the freezer. 2. Blend the rest of the ingredients together, with either a stick blender or standing blender. 3. Pour the mixture into a small saucepan or (even better) a double boiler, and heat slowly. Whisk or stir frequently to keep lumps from forming (a whisk will work better than a spoon for this). When the curd begins to thicken to the point where it coats the spoon or leaves a trail when the bottom of the pan is scraped with a spatula, or is 170F, remove it from heat (don't let it get to boiling). 4. Immediately whisk or stir in the margarine. Keep stirring until it is melted and incorporated. Make sure to stir constantly to avoid scorching. 5. Taste. If you think it's too "sharp," try adding another tablespoon or two of margarine, or some more stevia. The curd will continue to thicken as it cools, so don't worry if it seems a bit thin. 6. Put the curd into an airtight container. A piece of plastic wrap on the surface will keep a "skin" from forming. Cool completely before using. Using fresh lemon juice tastes best, although if an organic brand is available in a bottle it is almost as good. Lemon zest adds more flavor for you, but if you like a smooth lemon curd, don't use it.